Bermaz Motor has given the Mazda CX-5 and CX-9 an upgraded equipment list as part of a minor update for both models. This comes with the announcement of its new price list for Mazda models with the sales and services tax (SST), which was implemented on September 1. Starting with the locally-assembled (CKD) CX-5, a powered tailgate is now standard for the following variants: 2.0G 2WD GLS, 2.5G 2WD GLS, 2.2D 2WD GLS and 2.2D AWD GLS. The only variant that misses out on the feature is the base 2.0G 2WD GL. In terms of pricing, the base variant starts from RM132,389.59 on-the-road without insurance, followed by the 2.0G 2WD GLS (from RM148,214.45), 2.5G 2WD GLS (from RM160,004), 2.2D 2WD GLS (from RM164,693.85) and 2.2D AWD GLS (from RM174,479.90). Those who want a metallic paint finish will have to pay an additional RM377.36 on top of the aforementioned prices – premium metallic colours (Soul Red Crystal, Machine Grey, Snowflake Pearl White Pearl Mica) are a RM3,000 option. As for the CX-9, Apple CarPlay and Android Auto are now officially supported by the MZD Connect infotainment system via a USB cable, and is standard on both the 2WD and 4WD variants of the three-row SUV. Also introduced are a 360-degree camera that utilises four separate cameras to aid during parking and reversing, and the front seats now come with a cooling function in addition to the existing heated mode. The CX-9 remains a fully-imported (CBU) model, and is priced at RM288,610.40 for the 2WD variant, while the 4WD variant goes for RM305,610.40. All new Mazda vehicles comes with a five-year/100,000 km warranty and three-year/60,000 km free maintenance (except the BT-50). Please reduce price by 50% otherwise it is an expensive buy. There is a typo on the base model is GL . Maybe the 2.0G 2WD GL that misses out. Just maybe. Yes, sorry about that. It’s been amended. Thank you for the spot. 2.0GLS with or without ? Why introduce a model then update it later on b4 a facelift? This just shortchanges current owners and makes them wary to hold their future purchases until these changes had been done. I have booked my CX-9 from Bermaz Glenmarie back in June 2018 but only last week (Oct) I was told that the car finally reached the Malaysian port. But even worse I was asked to pay extra RM7k for these 3 additional features that I never wanted nor agreed when I first made the booking back in June. Until now, they are not releasing my car yet as still in discussion with their management. What’s happening Bermaz?!! Anybody else caught in this situation? Hi there, can you tell us how much you topped up? How does your s.a. Justify it? Will cx5 receive the update on Apple car play? Other country like Taiwan the 2019’s CX-5 updates include Apple carplay or Android Auto, 360 view, powered tailgate, full advance safety even in 2.0 GLS model onward (and the ACC start from 0 – 145km/h range) and HUD. Highest spec model only sold at ~RM154k. 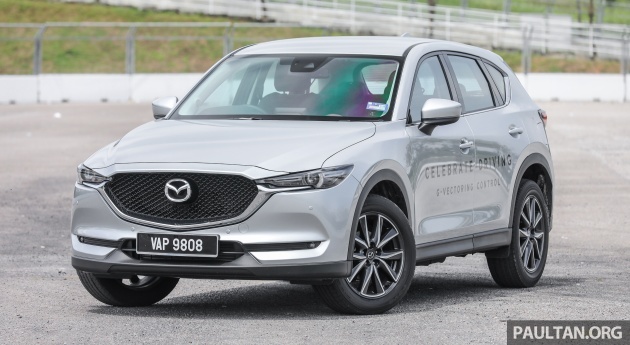 In Malaysia CX-5 only updated powered tailgate, but highest spec model priced at RM175k. Just curious why is it so? Because the general Malaysians would still pay at RM175k for lame specs.